Boy Erased To those about to dine on Jell-O salad with judgy, saved cousin Carol, we salute you. BOY ERASED. I first became aware of Joel Edgerton with Warrior (2011), a harrowing and beautifully crafted movie about cagefighting, in which he gives a tremendous performance. Animal Kingdom had been released the previous year but I mostly recall that I was disinclined to enjoy it because it had so much ersatz street cred. Anyway, he's been one to watch ever since — a versatile actor in direct communication with the dark parts of the psyche, seeming equally comfortable with the highs and lows of the human condition. That much is readily apparent watching him act; the sneakier thing is that he is also a driven, imaginative writer and director of movies who is quietly building a significant body of work. For this, his sophomore directorial effort (following 2015's The Gift), Edgerton adapted Garrard Conley's memoir, bringing to bear many of the same narrative and cinematic techniques that made his debut so deliciously off-putting and memorable. Jared Eamons (Lucas Hedges) is a model son: kind-hearted, hardworking and an academic and athletic success. He keeps a part-time job at his dad's Ford dealership. Jared's dad Marshall (Russell Crowe), in turn, has a part-time job as a pastor. They have an open, loving relationship, of which his mom Nancy (Nicole Kidman) is an integral part. Trouble is, Jared is gay and only just beginning to understand it. A dalliance at college turns into a sexual assault, after which Jared's attacker paints him as some sort of serial pervert to Jared's parents. Marshall, shaken and uncertain, seeks the unwise counsel of some of his flock and sends his son off for conversion "therapy." What follows is a wide-eyed examination of the folly of that decision and of the dangers inherent in the clannish, arcane limits of fundamentalist thinking. 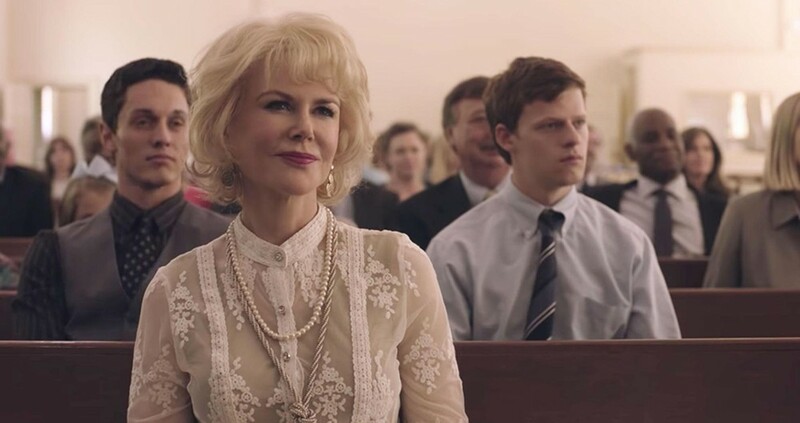 Boy Erased moves with the measured pace and chilled aesthetic of an accomplished horror movie, while simultaneously exposing the raw emotions of all involved parties. It captures, in every frame, the trauma of burgeoning personal identity put on trial, of a person's truth running up against a lifetime of indoctrination. But it is also suffused with kindness and love, with the struggle to figure out what's actually right and how to act on it. It is a significant and accomplished movie, technically, as well as thematically, and an exceptionally well-acted one. Crowe does some of his best work in years but Hedges is the undeniable stand-out. In one scene in particular, late in the third act, he backs down the bull-elk playing his father and the power of his performance is palpable. R. 114M. BROADWAY. THE BALLAD OF BUSTER SCRUGGS. Detractors sometimes deride the Brothers Coen as contemptuous of their characters. While this is not entirely inaccurate, I think it misses the point. At least in their art, the Coens seem to me contemptuous of humanity or at least of its baser, more venal urges. Their characters are merely a reflection of a deeper misanthropy. They've showcased this in any number of their movies but perhaps never quite as vividly as in their latest, a series of vignettes set in amongst the gorgeous vistas of the archetypal Old West (and apparently drawn from the work of Jack London). The movie opens with the titular tale about a warbling gunslinger (Tim Blake Nelson) who's unaware of the extent of his own hubris. It then moves through half a dozen examinations of the futility of hope and the desolation of existence exposed when that futility is acknowledged, which may color the whole affair as bleaker than it plays out on screen. Like all Coen productions, Buster Scruggs is cheeky and humorous, even as it points our eyes squarely into the abyss. And this, with sumptuous cinematography by Bruno Delonnel, may be the best looking movie in their formidable catalog. It's stark and troubling, but the darkness is balanced with humor and, hiding in the shadows, maybe the slightest glimmer of hope, despite the odds stacked against it. R. 132M. NETFLIX. A CHRISTMAS STORY (1983). You'll shoot your eye out. PG. 94M. BROADWAY. CREED II. The sequel pits Adonis Creed (Michael B. Jordan) and his trainer Rocky (Sylvester Stallone) against the ghost of Rocky movies past: Drago's son. BROADWAY, FORTUNA, MILL CREEK. RALPH BREAKS THE INTERNET. More video game hijinks voiced by John C. Reilly and Sarah Silverman. PG. 112M. BROADWAY, FORTUNA, MILL CREEK, MINOR. BOHEMIAN RHAPSODY. Rami Malek brings Freddie Mercury's larger-than-life persona to screen but the rest of the band appear only as foils. The conventional plotting and scrubbed story can't dampen the exhilaration of the live-show recreations. BROADWAY, MILL CREEK, MINOR. CAN YOU EVER FORGIVE ME? This true-life tale of a floundering, alcoholic author (a brilliant Melissa McCarthy) who finds success in literary forgery has the tension of a thriller while avoiding the empty mimicry of other biopics. R. 106M. MINOR. THE GIRL IN THE SPIDER'S WEB. Lisbeth Salander (Claire Foy) is on the trail of NSA doomsday software in another adaptation with the requisite wintry Stockholm aesthetic and a plodding narrative that's for super-fans only. R. 117M. BROADWAY.